Reef Entertainment released a lone screenshot from Rambo: The Video Game. It shows off one of the many places where Rambo will kill people in this shooter. 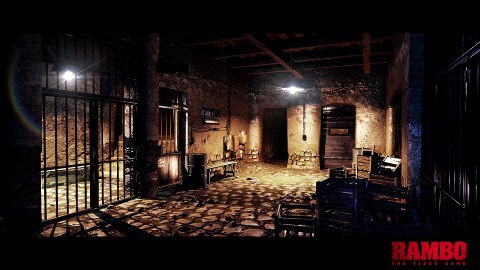 The screenshot shows some sort of prison environment. The game is said to take players through missions based on the films. This scene, then, appears to be inspired by Rambo III. In that movie, Rambo traveled to Afghanistan to rescue his mentor Colonel Trautman. This is the fourth screenshot released for the game so far. The other three didn't have any characters in them, either. The environments themselves look nice but it's tough to really evaluate the visuals without seeing Rambo and the piles of bodies he leaves in his wake. Rambo: The Video Game doesn't have a release date yet. It's in development for the consoles and PC.